Kickstarter has really taken off over the last year or so. Since its inception in 2009, the self-described “funding platform for creative projects” has helped coordinate funding for more than 10,000 ideas. Proposals span from indie films to art projects to tech innovations to music projects. In 2011 alone, backers donated nearly $100 million and nearly 50% of the projects proposed on the platform successfully attained full funding. Other platforms for crowdsourced funding, including DonorsChoose, have also gained some traction. DonorsChoose targets donors with a different interest — helping classrooms in need of supplies. In Madison alone, 21 teachers have proposed projects that would help fund everything from beanbag chairs for an independent reading area to new musical instruments. What does this mean for organizations? Crowsourced funding platforms can unite two key groups — donors who know and love you and your organization and donors who are passionate about a particular topic or idea. For those who are already familiar with your organization, a public platform for funding a specific project could provide these donors a home base that would allow them to share their passion for your organization with friends and family members. By tapping into an existing platform, you can also reach out to those who are not yet familiar with your organization, but who are passionate about your project’s topic. Create a crowdsourced funding platform for your organization. Lots of organizations and nonprofits have been looking for ways to use their social media communities to drive fundraising. Adapting or building a Kickstarter-esque platform for your organization could provide the structure and home base needed for this type of social fundraising. But, you’ll have to be judicious about determining which projects would work best with this approach. Small, innovative projects with short time frames for funding and implementation would probably be the best fits. Look for opportunities to use existing crowdsourced funding platforms. Does your company have an awesome idea for a new technology? Is a group at your school ready to produce a documentary or EP? Send them to Kickstarter and make sure they include information about and links to your organizational website. Have you considered using Kickstarter, DonorsChoose or another platform for your organization? Have you already implemented this idea? What’s working? What’s not working? In 2009, a new social platform entered the scene: Pinterest, a visual pinboard and social bookmarking site. I had used the Notes feature in Google Reader to collect links of personal interest (read: recipes and knitting projects) for quite some time. So when Google Reader discontinued support for Notes in 2011, I joined Pinterest and began pinning. So far, Pinterest gets high scores for a clean, simple and attractive user interface, for rising adoption rates, and for the ease of sharing. The main dings at this point are the platform’s lack of integration with other social sites (although they did recently enable Facebook integration capabilities) and the lack of tools for businesses and organizations. Because the site is still relatively new, this also means that they haven’t begun to offer advertising yet. In my professional capacity as a community manager, Pinterest hasn’t entered my radar yet, and isn’t likely to do so. My organization was a great candidate for Google+ because many of the early adopters were people in the tech sector, which is one of our key audiences. Pinterest, however, is dominated by women, and most pins relate to lifestyle topics. Thus, not on my radar. If you’re considering using Pinterest in a university setting, think about whether it’s a good match for your target audiences. Two schools that have done this fairly well are Texas A&M and Miami University. Though not perfect, their boards are branded well and address topics that are visually engaging and appropriate for student, alumni and donor audiences. 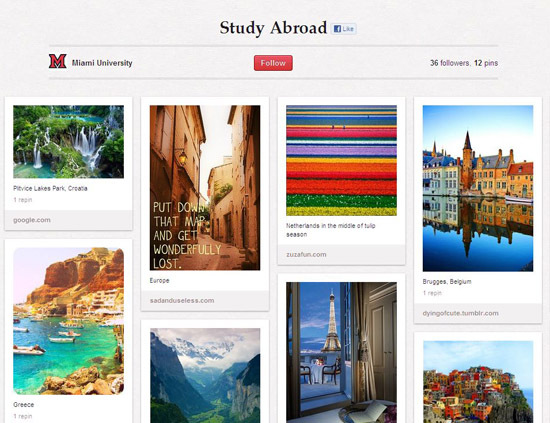 I was particularly impressed with Miami’s study abroad board. In fact, the more I think about it, the more I’m inclined to say that a school that focuses heavily on study abroad programs (Butler University, for example) could focus on using Pinterest to promote international study opportunities. You could do one board for each program location and pin general travel information as well as individual students’ blog posts. Is Pinterest on your radar? Are you likely to use it?